It’s my birthday, which means it was up to my sweetie to figure out dining plans. He decided on La Belle Verte (166 rue Eddy in Hull). It opened around this time last year, which is super awesome for anyone who is interested in healthy eating. We don’t get there very often because it has relatively short hours, and we rarely brave crossing the river during rush hour. But for my birthday, we made an exception. This is the appetizer we ordered, and devoured. For those of you who don’t know, La Belle Verte is a mostly-vegan (some dishes contain honey), mostly raw-food restaurant in downtown Hull about five minutes over the Chaudière Bridge. It’s mostly a lunchtime destination. The place is cheery and open concept, with mismatched tables and chairs and an old piano (which someone played beautifully through much of our meal.) A display case shows off the desserts, and you can watch while your meal is prepared if you choose. 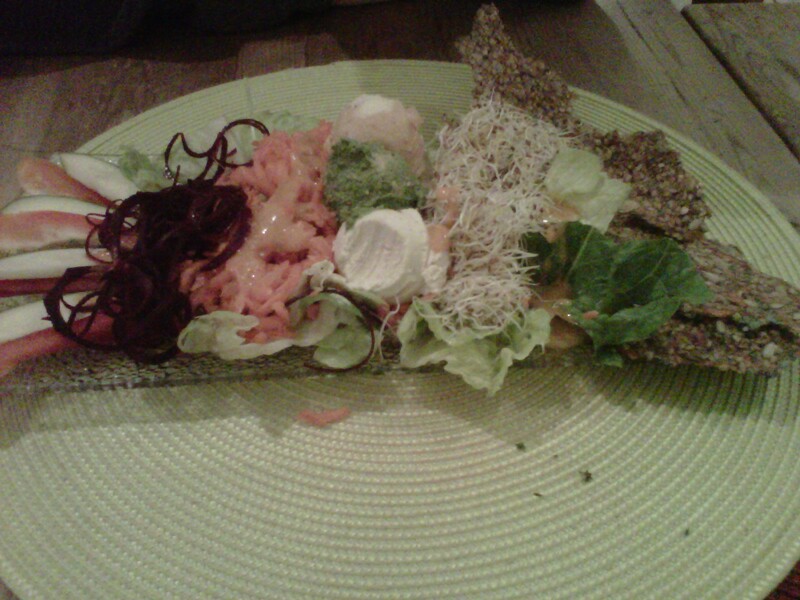 We ordered a raw appetizer, that consisted of various raw pates and cheezes along with raw vegetables and dehydrated seed crackers. It was nice. The proportion of stuff to dip into was pretty well matched with the number of things that were dippable. 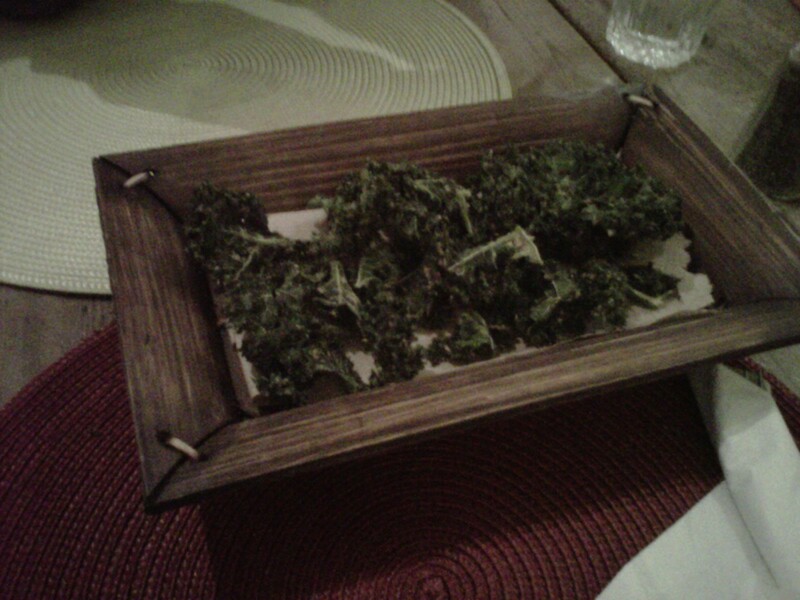 I also ordered a side of kale chips, because LBV makes delicious kale chips. I have a dehydrator (which I purchased as a result of being inspired by LBV’s kale chips) but my chips are not as good, no matter how hard I try. Having them is a treat for me, because they aren’t really a budget-minded option. I’ve had many omnivores try them, only to be very surprised by their deliciousness. For my main course I had the peanut thai tofu sandwich, which comes on chapati bread with carmelized onions, red peppers, alfalfa sprouts, and shredded carrots. It also comes with some mushrooms, but as I loathe and detest them I requested they not be on my sandwich. My partner had a tofu mushroom burger, which was similar to mine only inverted (lots of mushrooms, less tofu) and came with a generous salad. I actually forgot to take photos until I’d already finished eating it. The sandwiches were delicious. I actually skipped dessert as most of them combined chocolate with fruit, which isn’t a favorite of mine. The chocolate tarte, which I have enjoyed in the past, seemed to have raisins in it this time. Raisins are another thing I intensely dislike. However, if you’re looking for extremely decadent, yet surprisingly healthy vegan desserts, LBV is a great place to find them. If you’re looking for a light, healthy, but delicious meal, this is a good place to come. If you’re looking for super-rapid and attentive service, that is not the forte here. But that’s ok. They’re plenty nice, you just might have to remind the server that your meal came with a salad. 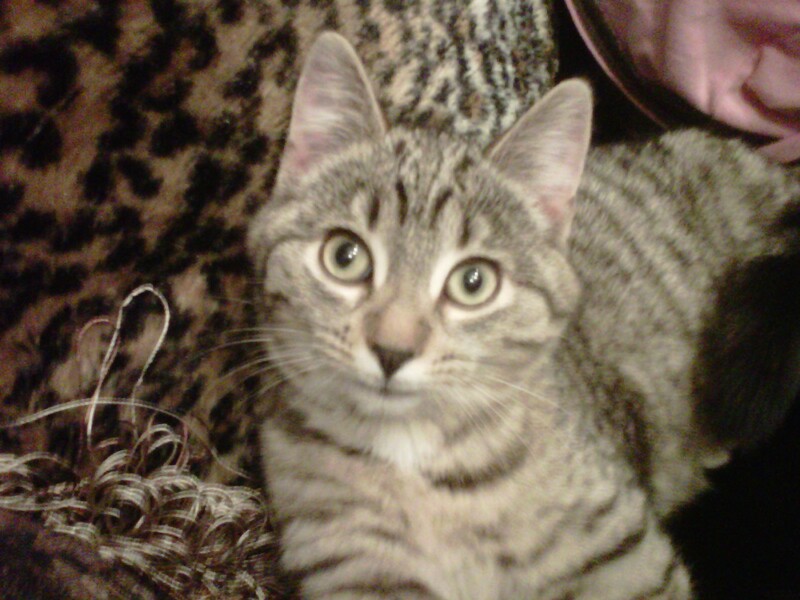 To close, I’m going to share a photo of my adorable kitten, who I love very much. She sat beside me while I wrote this. Her name is Septembre. Her mom was a stray my cousin took in. Please say no to breeders, and always adopt!